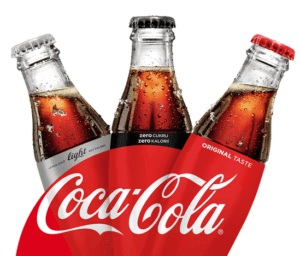 Home » Articles » Coca-Cola: a second black gold? Coca-Cola: a second black gold? Although Coca Cola is not an alcoholic drink, it does not help your health. The amount of sugar in Coca Cola is so big that without the additives, human body would not accept the drink. Yet, Coca Cola (known also as coke) is the most popular soft-drink in the world helping its shareholders raise their earnings faster than the sugar level in their bodies. What secret is behind the success of Coca Cola and can one make money on its shares? Coca-Cola and health are two things that have little in common. Coke was invented in 1886 by a pharmacist John Stith Pemberton as a medicine for curing fatigue, nerve disorders or digestion. So, the original goal of Coca Cola was to positively impact the human body. Remarkably, at that time positive effect was also associated with commodities such as tobacco and alcohol. As far as alcohol is concerned, some sources claim that originally Coca Cola contained not only coca extracts but also Mariana wine. Perhaps a more interesting fact is that the original logo of Coca-Cola, the one designed by Pemberton’s accountant and secretary Frank Robinson, has survived since 1886 until today. IPO (Initial Public Offering) is an important piece of information we should know about each company. While the majority of companies have offered their shares recently, the history of trading Coca Cola dates back to 1919. By the way, at that time one share of Coca Cola cost USD 40, while today it is USD 450! The long-term value of Coca Cola shares since the IPO has been growing. One may say that if you buy Coca Cola shares you will never lose. However, remember that at the very beginning Coca Cola was thought to be a controversial drink. Too much sugar has negative impact on human health. And on top of that, when you consider artificial sweeteners (suspicious of causing cancer) you face a problem. In some countries the recipe has had to be modified. For example in Germany you will find coke with genuine sugar, while in the Czech Republic the drink contains sweeteners and cheaper ersatz-ingredients. The price of Coca-Cola shares has more than doubled over the recent 10 years. Litigations, potential bans, and modern lifestyle have dealt Coca-Cola severe blows. As an investor, you must be aware of this and vigilant. Equally important is the sales performance i.e. financial statements. Binary options are safer than traditional shares. Binary options will not let you erase your total trading account due to one unsuccessful trade (… unless you choose such a risk voluntarily.) The holding and buying of binary options does not cost you any fees. Coca-Cola shares are volatile i.e. tend to react to emotions. Therefore trading Coca Cola shares is not the ideal choice for beginners. Trading Coca Cola offers a huge opportunity not only for a beginner engaged in transactions with shares that have been in circulation for nearly a century. To find various trading ptterns for trading binary options is not difficult. For example, IQ Option is one of the broker’s offering this. You may see Coca Cola as a refreshing drink or a second black gold. The angle of view is purely your choice. The above text is not an analysis of investment opportunities or recommendations. The text does not comply with Act no. 256/2004 Coll.., (ref. Capital Markets Undertaking Act) regulating rules for the analysing of investment opportunities or recommendations.